I'll slip a picture of my latest batch of shiny purchases in while there hasn't been much Sengoku Basara news to report recently. False rumours about an E3 appearance thanks to a French mistranslation of a Famitsu comment were the most exciting thing to surface since my last update. Since that wouldn't make a very interesting post, here's what I have received recently instead. The five doujinshi are heavy on comedy, just the way I like it. I bought the two Crows Zero movies from MVM at last week's London Comic Con/MCM Expo event for £5 each on the assumption that you cannot go wrong with films about angry thugs. The Highschool Of The Dead OAV DVD 'Drifters Of The Dead' came from the same event; it's a pointless fan service episode with a weak PAL encode. It's still unavailable in the US so I decided it was worth the £5 Manga UK were asking at their stand. Fans who missed it at the event can still obtain it as part of the UK 2013 series sets (or separately from United Publications). 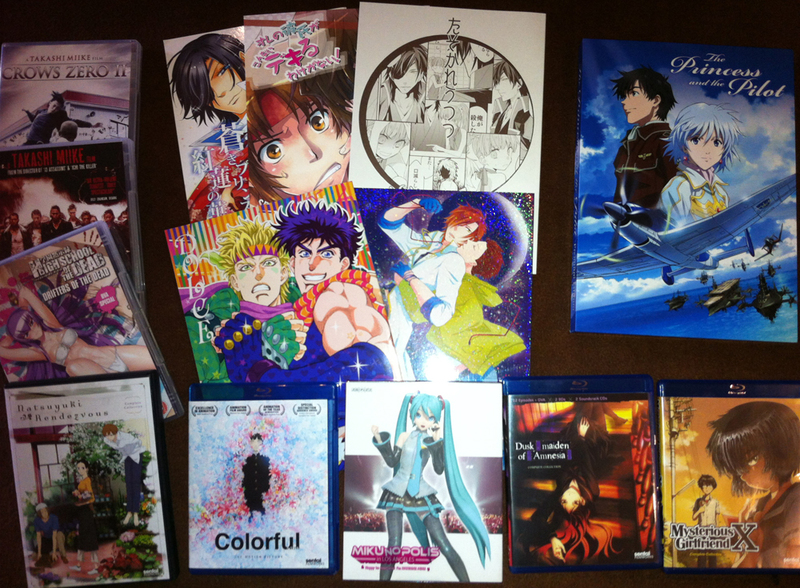 A shipment of US anime discs rounds off the pile of goodies. 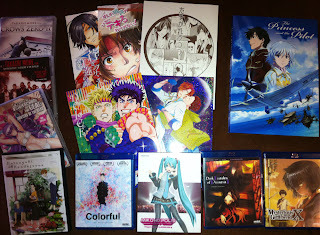 Aniplex Of America's Mikunopolis Blu-ray/CD set is gorgeous, as is Sentai's Dusk Maiden Of Amnesia (with two bonus CDs). The others have some flaws of varying severity which I should mention: Mysterious Girlfriend X is encoded with 1080i video, Natsuyuki Rendezvous is DVD-only, Colorful has a glitchy transfer and - far less severely - The Princess And The Pilot's otherwise-amazing box set has a noticeably pixellated picture on the disc itself. It's not the end of the world - of all the places they had to screw up with a picture, the disc artwork is the most forgivable. I'm rather disappointed about the on-disc video problems with Colorful and Mysterious Girlfriend X, though. This is the true cost of cheap anime pricing in the western market. 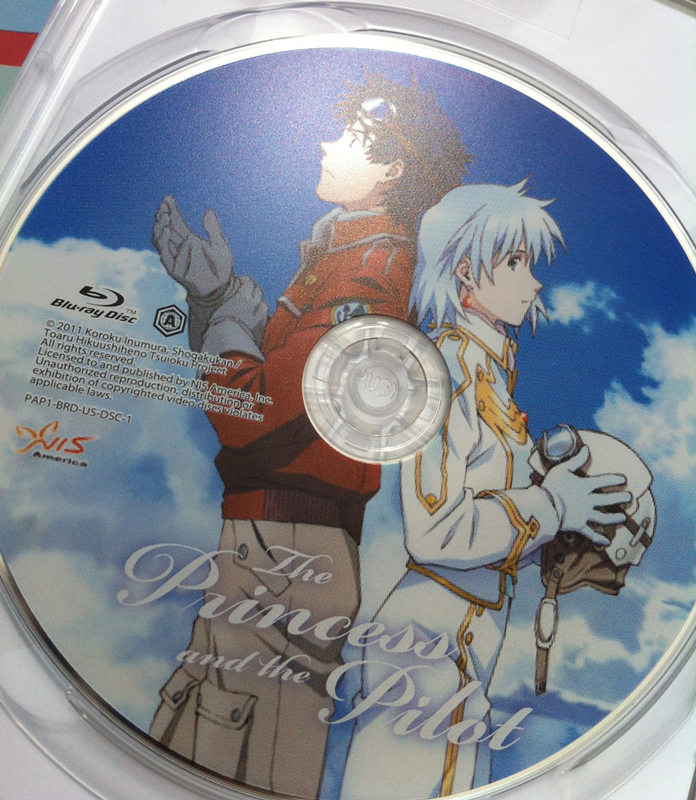 Going back to The Princess And The Pilot, I hadn't noticed before how closely the designs resemble those in Evangelion. Matsubara Hidenori's work has flown under my radar for far too long; it was definitely a good move to go for the special edition release of this film. Given the care that they appear to have paid to the rest of the package, I can't imagine that the flawed disc artwork was used intentionally. My best guess so far has been that the image was used as a temporary placeholder while they were waiting for some higher resolution artwork. Perhaps the new artwork didn't arrive, was forgotten about, and no one doing quality control looked at the placeholder art close enough to notice that it shouldn't have been there.